Welcome to the MuCAARD-UK website. Please look around and find out more about who we are and what we do. MuCAARD-UK supports community based development organisations in developing countries to improve the lives of disadvantaged groups; enabling them to grow hope, gain confidence and strengthen their capabilities through non-violent action. MuCAARD has shown that impoverished people are resilient and resourceful, and with support, can work their way out of poverty and conflict. MuCAARD-UK is committed to supporting them in any way that they can with the limited, but generous gifts we receive. However to maintain this impact we need new avenues of support, either for one off projects or for more regular funding. 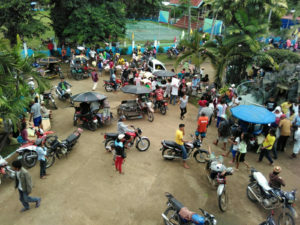 MuCAARD is a unique organisation, jointly set up by Muslims and Christians to work together for peace and development on the island of Mindanao in the Philippines. The key to the work of MuCAARD is peace and sustainability. Our aim is the building of sustainable communities by increasing skills and capacity and by encouraging self help. MuCAARD-UK is a Registered Charity established in 2007 to raise money to support the work of MuCAARD in the Philippines. BISAP – Bukidnon Integrated Services Assistance Program Inc. situated in Damulog, Bukidnon. Peace Building between communities which have been divided through their cultural traditions and mutual suspicions and to bring harmony where discord has previously developed into conflict. Sustainable Livelihoods enabling rural communities to implement projects to protect conserve and rehabilitate the environment together with providing economic growth. 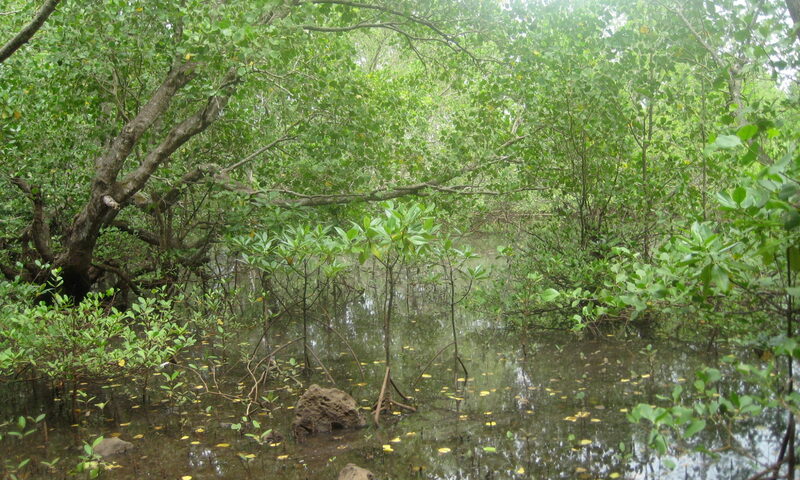 Environmental Protection with projects such as the Kahoy Project and mangrove reforestation, which not only provides environmental protection for the local area in countering soil erosion and land degradation but also contributes to the global fight against Climate Change. Disaster Risk Management – to reduce the toll of disasters through community participation in pre disaster risk reduction planning and strategies, emergency response and post-disaster rehabilitation and reconstruction. *Official address: 11th-15th Streets, Nazareth Subdivision, Cagayan de Oro City Misamis Oriental, Philippines. Here is a list of our current projects, for further details please see Linda’s Blog and the update pages. Supporting local communities to set up self-help groups to insure against costs associated with accessing medical help. Redeeming land which has been mortgaged (prenda), often to cover health and education costs, to allow them to take back the fruits of their land. Working with displaced communities following the siege of Marawi in May 2017. 1. Coaching and mentoring of individual farmer-beneficiaries for project orientation. 2. Project Orientation and Vegetable and Crop Production Training. 11 attended the training and developed individual Farm Plans. Crops identified for the project are peanur, vegetables, ginger and tumeric. 3. Procurement of seeds and organic fertilisers. View the full Project Update. Mecha Grace and her mother Lilibeth. After visiting the Rural Health unit in July with a fever, Mecha was sent to the hopsital. Support from PuLPuG meant they were able to pay for her treatment. “Lea Jane is my 4th child. I spent a long time in hospital because as I had to have an emergency Caesarian my baby needed to be incubated. It would have been very hard if we hadn’t been a member of PuLPuG. We were so happy that the Federation were able to help as we had no-one else to turn to. It would have made life very difficult if we’d been forced to borrow money as interest rates are very high (at least 20percent a month). The assistance of the Federation was a huge help to our family and we are extremely grateful. We didn’t have to pay any expenses as we kept all the receipts from the medicines we had to buy that weren’t available in the hospital. I am encouraging families in my village to join PuLPuG as it is clear how much we can help each other and our families. The monthly dues are nothing compared to the help we receive if members of opur family get sick. Even if the local officials are unhappy with us for organizing PuLPuG (because they think it is a political organization) in our village we will continue regardless as it is a great help at times when we are sick. I am 38 years old, with 2 children one of whom is now married and expecting her first baby so soon I will be a grandmother! We are happy we have PuLPuG as there is no-one else who will help us if we don’t help ourselves.We are really happy and grateful for the help of the Federation it gives us confidence that we can buy the medicines we need if they are not available in the hospital.If there was no PuLPuG we would have to borrow at high interest rates to pay for the medicines. We could be forced to sell our chickens and pigs which is not possible as they are our only source of income and only just enough for our needs. Despite threats from local officials I am not afraid to attend meetings as the group’s aim is to help each other. The P25/month is affordable as it covers the travel expenses if we need to go to the hospital and food for the person who has to stay and look after you. The group buolds up savings and pay a monthly membership to the Federation to cover any expenses not covered by the Government health scheme (PhilHealth). I have received a lot of help from the Federation. The siege of Marawi City in May 2017 left over 300,000 people displaced, more than 94% of them sought refuge with relatives and fellow clan members in towns and villages surrounding Marawi City and Lake Lanao. This placed greater strain on already stretched resources. The Ramadan Assistance programme funded by MuCAARD UK extended assistance to forty displaced families with nutritious food needed to survive during the period of fasting. Sometime ago, the farmers only produced corn and upland rice. Today, they already tap the rubber trees that were planted through the “Plant Now, Pay Later” rubber production program in 2008. “We no longer teach our children how to dismantle and assemble guns. Instead, we teach them how to tap rubber trees”, one leader said. Coconut and other permanent crops (coffee and cacao) are on the bearing stage. Those engaged in banana production have been enjoying the good harvest. Backyard poultry and livestock are prominent. These are the dividends of peace. Once, the people relied on animals of burden (carabao and horses) in bringing their products to the town. Now, the people transport their products using motorcycles and four-wheeled vehicles. Ustadz Anwar Montawal calls: “We used to start our journey to Damulog centro at dawn and arrive home at seven in the evening. 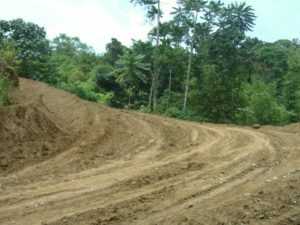 Now, we can go to the town at any given time because of the road that the local government built. Today, many of us own a motorcycle. Ustadz Thong Ibrahem (another leader) owns two Suzuki multi-cabs, he contined. 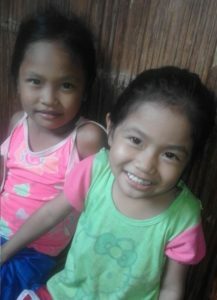 CRISTENE AND ALTHEA ARE MY TREASURES! Cristene and Althea are Gretchen Siva’s treasures. 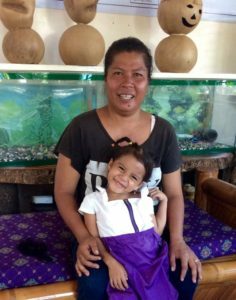 She is a young mother who would do everything to keep her girls safe and healthy at all times. With that in mind, she believes that the self-help concept of PuLPuG is relevant to her family’s need as preparation in times of sickness. Cristene and Althea were admitted to the hospital on November 23, 2017, due to fever convulsions. 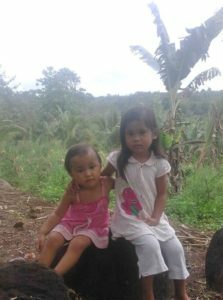 Cristene contracted UTI, while Althea had pneumonia. Life is tough for Romeo and Gina Ybañez. They have two children; they are also taking care of their three nieces. Romeo is a farmer but he doesn’t own a farm. He is a share-tenant of two landowners. “I am thankful for our Pastor because it was through him that we heard of an organization called PuLPuG. With eagerness we joined the organization. Php 20 per month per household is not a heavy burden. We will have a good harvest if take care of our maize farm. This is my perception of the program. Even if we do not benefit from the money we contribute, it will be a joy to know that our monthly contribution can help a neighbour in need. We do not want to get sick, but when my daughter Rheana and my niece, Gretchen, had pneumonia at the same time, we were able to bring the two sick girls to Kibawe Provincial Hospital because our group paid for the transport and provided food for the watchers. The Federation also paid Php 2,210 worth of medicines which were not available in the hospital pharmacy. Without PuLPuG we would have been in a complete loss where to find the money. We are very grateful that we bonded together to help each other in times of need. We will continue to do this and pray that more families will join the organization. In The Philippines they broke world record after planting 3.2 million trees in just one hour. 🌳 this deserves to be shared! Thank you to all our generous donors. Many people who donate via the PayPal Giving fund don't tell us who they are, so here is a thank you anyway! If you donate in this way do tick the box that lets us have your email so we can say thank you properly. Heres the link. If you are a UK taxpayer you can register for giftaid on this site too and Paypal will do all the work for us and claim the gift aid on our behalf. The link is under the "receive a tax receipt" section - of all the silly places... but it does give us 20% more at no cost to you. The root crops and vegetable project is starting! This is a project that helps farmers in poverty who have had to mortgage their crops via the "prenda" system. They will underplant the coconut palms with peanuts, ginger, vegetables, ginger and turmeric and will be able to keep the income from the crops. They have bought the fertiliser and seed for the ginger and the vegetables (tumeric and ginger have to be planted fresh). 13 farmers have been trained, 7 of them women. The prediction is for extreme heat in the first three months of this year and drought for the first 6 months so planting is delayed until the weather conditions are more favourable - the drought has already damaged many crops in the area. Our Imee won a prize for her work in the Philippines - congratulations to her and to the whole team for all their work. This was at the USAID conference.